Of the many challenges school libraries confront—meeting the need for instruction in multiple literacies in the face of contracting budgets, changing regulations, and more—the most basic remains the need to maintain inspiring, wide-ranging collections that serve a diverse student body, often across sizable school districts. Increasingly, public libraries have been finding creative ways to join forces with school administrators, librarians, and media specialists on collaborations that meet students’ evolving needs in and out of school. Public libraries and schools have discovered innovative methods for sharing collections, providing access to materials and services, and getting library cards into the hands of students. Increasingly they have developed citywide policy around their partnerships, ensuring that the work they have begun will be on­going and embedded in school and municipal civic culture. Over the past few years, a number of these joint efforts have demonstrated not only imagination and replicable models but staying power. 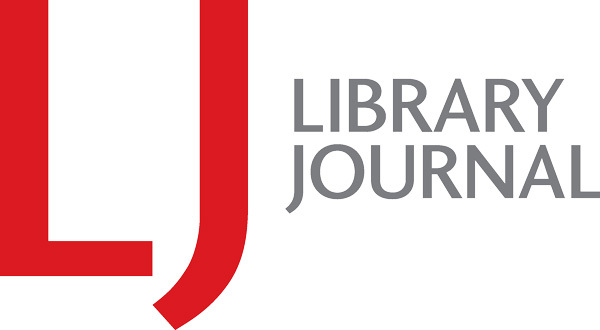 LJ looked at several such initiatives in “Public Partners” (LJ 3/15/17), and additional programs were surfaced at the LJ and School Library Journal summit “Stronger Together: Building Literacy-Rich Communities,” held May 10–12 in Omaha. At the two-day gathering, produced in partnership with Omaha Public Schools and the Omaha Public Library, key players discussed the challenges and rewards involved in several such citywide projects, offering a look at unexpected benefits, potential pitfalls, and best practices that public library and school partners can learn from and make their own. 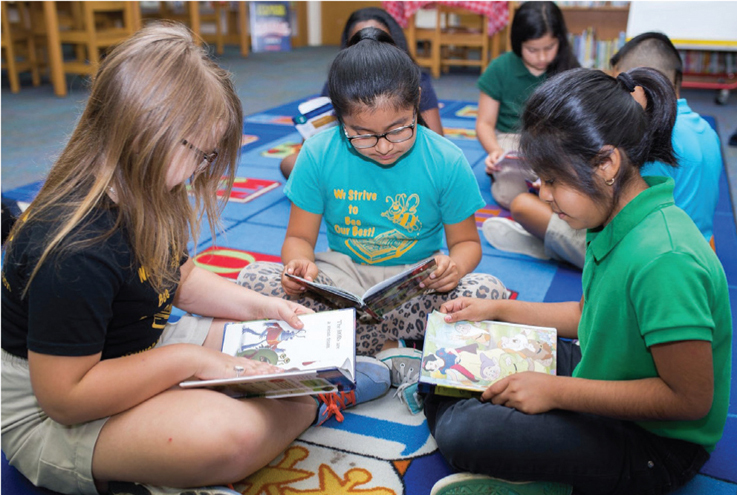 When it comes to durability, few alliances can beat the nearly 150 years of partnership between Indianapolis public libraries and schools. In the late 19th century, the city’s first school superintendent proposed that libraries provide reference materials for the schools. In 1879, small reference libraries were placed in 14 of the larger elementary schools. They proved so popular that the library was asked to provide them for all schools. This arrangement lasted until 1966, when a countywide public library was established and schools began to operate their own libraries. In 1989, an anonymous donor bequeathed $24 million to Marion County college and high school libraries and the Indianapolis Public Library (IndyPL). With leadership from IndyPL and the former Indiana Cooperative Library Services Authority, county high schools began to link their catalogs to the public library’s. 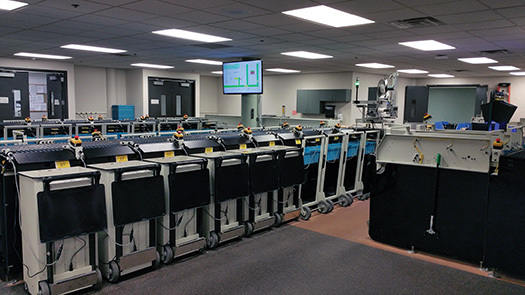 IndyPL placed terminals in all high school libraries, allowing students direct access to its catalog, and the collaboration that became today’s Shared System was born. Under the Shared System, school library items are cataloged, barcoded, and made searchable in the IndyPL catalog. School staff and students can see what’s available at ­IndyPL, their own school, and 291 public, private, charter, and parochial schools throughout the system, plus two local museums (cataloging for a third is in progress). They can access e-materials or request that physical items be delivered to their school or a library branch; a School Room Card lets teachers check out materials for an extended period. Public library users can borrow from school collections as well. Batt dove into what she calls “the care and feeding” of the Shared System, working to raise awareness among school faculty and administration of what it can bring them. She sends out a weekly newsletter, Friday Focus, that highlights system news, issues, and available resources. Every quarter Batt produces a circulation report, which also notes IndyPL items that have been sitting on school shelves longer than three weeks and need to get back into circulation. Keeping communication clear was critical to the partnership between the Muncie Public Library (MPL), IN, and Muncie Community Schools (MCS). Although the idea of a shared catalog was met with enthusiasm on both sides when then-director Virginia Nilles and the schools superintendent first began discussing it in 2015, shake-ups in the school system posed major challenges as the collaboration was beginning. The school and library boards had signed an inter­local agreement to proceed with the project in May 2016. 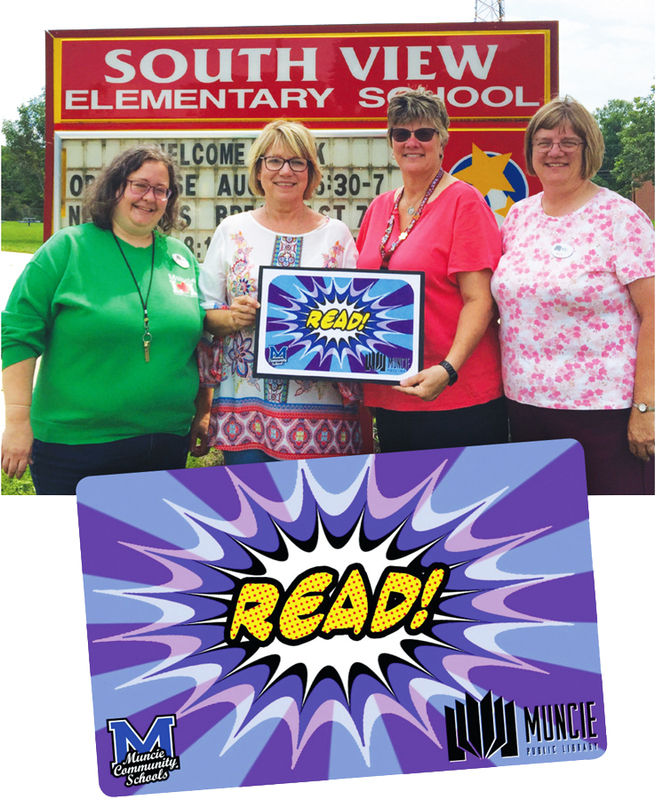 Of $40,000 in funding that the partnership requested, the Community Foundation of Muncie and Delaware County provided a grant for $20,000 in August, with MPL covering the additional $20,000; two elementary schools were brought into the shared catalog on a pilot basis. Motivate Our Minds, a local enrichment center with its own library, asked to be included as well. In April 2017, the school system was named a distressed financial unit by Indiana’s Distressed Unit Appeals Board (DUAB), which brought in an emergency manager to take charge of the district’s struggling finances. The school board voted to close three elementary schools as part of the city’s deficit reduction plan. Four MCS librarians were terminated and two transitioned to teaching positions, leaving only two certified teacher librarians, Rhonda Cowan and Melinda Sheffield, to cover the entire nine-school system, with the help of aides. Mitchell made it clear that the public library had no plans to interfere with their work and that they had control over what parts—and how much—of their collections they would share. 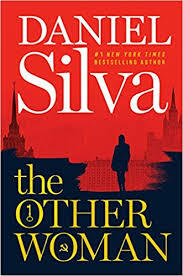 “I would say, ‘It’s your collection; what do you want to do?’ ” The interlocal agreement was also worded in such a way that it gave Cowan and Sheffield full power to make decisions about the project alongside public library staff. The system was up again by November 2017, however, and has run smoothly since. Each school’s catalog links to the shared catalog, and students’ cards work at both schools and MPL. Kids can also access databases; reading recommendation platforms such as TumbleBooks and NoveList are particularly useful, says Mitchell, as they can offer the aides help with readers’ advisory. As with Indianapolis’s Shared System, borrowing works in both directions. 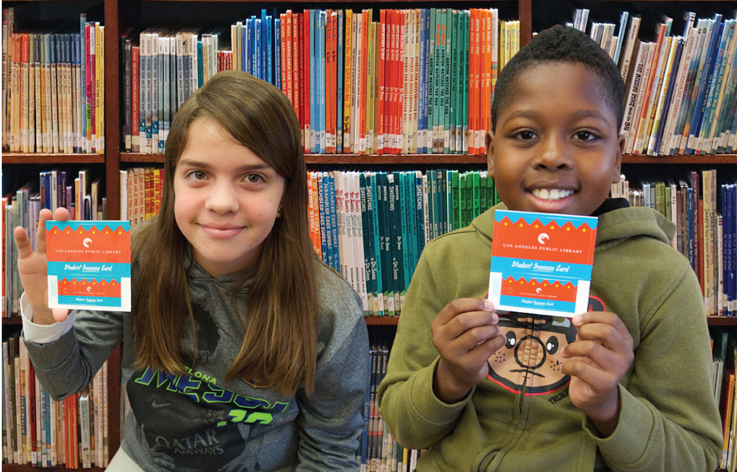 Looking ahead was crucial when LAPL launched its Student Success Library Card in partnership with the Los Angeles Unified School District (LAUSD). The card originated from a conversation between City Librarian John Szabo and Mayor Eric Garcetti about ways the city could help LAUSD, a sprawling system of more than 1,300 schools that has seen overcrowding, low performance, and administrative problems over the past decade, as well as a sharp reduction in school librarians. Szabo suggested issuing an LAPL library card to every student. 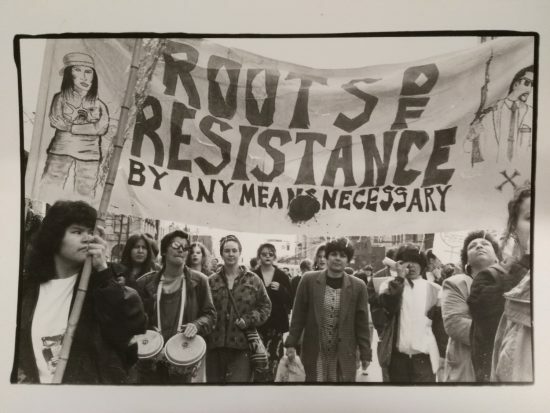 The library worked with a school district advocate, who in turn worked with LAUSD legal counsel to put together a conference call in which LAPL made its case. That both institutions shared privacy values was at the top of the list. “We went in saying, ‘here’s how important privacy of information is to us,’ ” says Broman, and the two drew up a data-sharing and privacy agreement satisfactory to both parties. Because Los Angeles has one of the largest undocumented populations in the United States, physical privacy was a concern as well. The Student Success card doesn’t require children to provide a home address, and an early rollout of the card through the mail to students’ homes has since been replaced with in-school distribution—also in part because recipients tended to throw out the envelopes without opening them. Distribution created another layer of work for school administrations, says Broman, so LAPL tried to simplify the process as much as possible, paying the manufacturing company extra to bundle cards separately for each teacher. The partners tested the first cards in fall 2016 and within nine months began to distribute them to students. Despite a turnover of four superintendents since the project began and the challenges of coordinating across the district’s huge sprawl, notes Broman, some 540,000 cards were issued in about two school years. Having the mayor’s office on board has been critical, she adds, and has opened doors across the district. Indianapolis’s Batt seconds the sentiment: visionary leaders at the top can make all the difference to a collaboration—whether they’re in city government or school administration. “When a principal signs on and says, ‘I’m going into this whole hog. I want to make sure every single teacher in my school knows how to request materials,’ that makes it work,” she says. NPL has begun installing self-checkout stations at schools, which will streamline students’ processes and help free up school librarians. 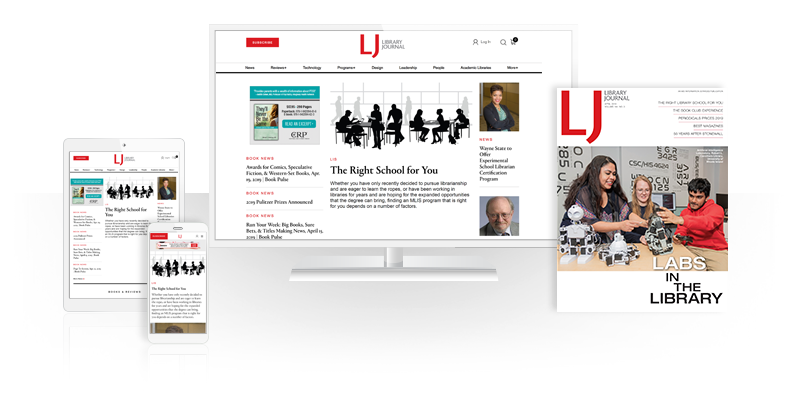 Heading into the 2018–19 school year, LL wants to highlight the resources and privileges available for teachers, including the educator card that all teachers receive. Among other perks, NPL offers “curriculum kits”—collections of about 30 grade-appropriate materials on a particular subject that include fiction and nonfiction books, DVDs, and manipulatives—which can be checked out for a six-week period. Another opportunity LL is considering is to extend the experience for students about to graduate. Some have been LL users for most of their school career, and Emily Farmer, LL collection development librarian at NPL, says, “We now have to find a way for them to continue as public library patrons,” possibly through a new type of library account or marketing targeted at graduating seniors.